I consider myself somewhat of a chocolate chip cookie aficionado. I’ve cooked and devoured my weight in these cookies over a lifetime, and I’m always on the hunt for the next best recipe. Up until now, no recipe has ever beat the chocolate chip pecan cookies at Alon’s Bakery just a few blocks from our house. With these cookies, Alon may have met his match. We spent last weekend at with our friends, Kirk and Todd, at their home on Lake Rabun in North Georgia. Our buds, Bruce and Felix, joined us for the weekend and Felix showed up with a huge container of chocolate chip cookies. Never in a million years did I think we’d eat all of them, but by Saturday night after cocktails, dinner, and a screening of Sordid Lives, I nabbed the very last one! A little gluttony, perhaps? I shudder to think how many calories we consumed! I think chocolate chip cookies should possess the ideal balance between chewy and crunchy texture. Also, I’m in the camp that believes that chocolate chips cookies should be heavy on the chocolate chips. I don’t usually have a have a strong opinion about whether or not to add oatmeal to cookies, but in this recipe, I’m convinced that the oats give these cookies that perfect consistency. The other secret to making the ideal chocolate chip cookies is not overcooking them. I always err toward undercooking them, and I’m never disappointed. Cooking time will vary from oven to oven, so I suggest that you start checking them after 10 minutes. After engorging myself on Felix’s cookies on several occasions, I finally asked where he got the recipe and if he could share it. As it turns out, his niece, Kiki, came up with the recipe, so she gets full credit for some of the very best chocolate chip oatmeal cookies I’ve ever had, and that’s saying a lot! 2. Using a hand mixer, beat butter, sugar, and brown sugar together in a large bowl for 3 to 4 minutes or until fluffy. Add eggs and vanilla extract and continue beating for 1 to 2 minutes. 3. In a separate bowl, whisk together flour, baking soda and salt. Add oats and chocolate chips and mix well. Add dry ingredients to butter mixture in batches, mixing well after each addition. 4. Spray two baking sheets with cooking spray. Roll dough into golf ball-sized balls and place 3 inches apart on baking sheets. Press dough to slightly flatten. Sprinkle with Maldon salt. 5. Bake for 10 to 12 minutes, or until bottoms are slightly browning. Start checking after 10 minutes and do not overcook. If cooking on two racks in the oven, rotate baking sheets to the other rack halfway through cooking time. 6. Remove from oven and cool for 5 minutes. Transfer cookies to a cooling rack and cool completely. Yes! I agree chocolate chip cookies should be heavy on the chocolate chips and I tend to like them just slightly undercooked. These look fabulous! I love chocolate chip oatmeal cookies! They are nice for a change. 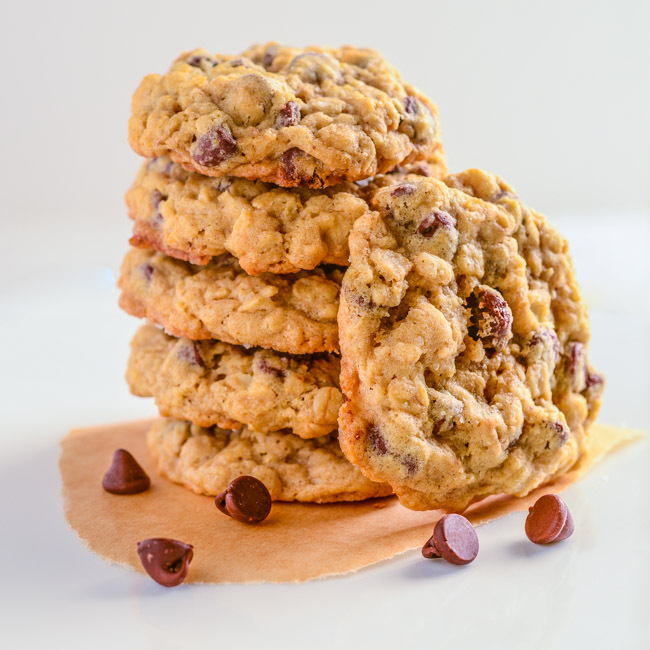 I need to mix it up a bit around here…I eat way too many chocolate chip cookies to even admit! Pinned! Bill I just had to pin these! They are seriously sooo perfect! Taking chocolate chip cookies out of the oven just before they’re “done” is a great tip! I’m not sure if there really is the perfect chocolate chip cookie recipe, although this one sure looks like it may be it! This is one of my favorite cookies, and I love trying new versions. So thank you!